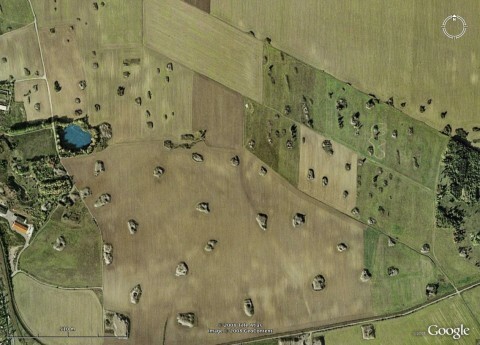 For any new players to Where on (Google) Earth, simply post a comment with latitude and longitude (or a description of the location) and write something about what the features in the picture are, or how they have developed. If you win, you get to host the next one. I invoke Schott's Rule: former winners have to wait 1 hour for each WoGE they got right. Posting time is 20:40 CEST (18:40 UTC). I'm away for the weekend and will return Monday night, so I won't be able to post a reply if someone caught this WoGE. Since it's online for over one week, I'll start to give some hints. I'm pretty sure about the broader region where to look for these features. I knew from the beginning that they must be recent, I also have some loose guesses what they actually may be, I just have no enough patience to find the needle in the haystack. If you zoom out to a more decent scale and fly around a little, you'll see what I mean. I'd say the Baltic coast of Germany somewhere, but I don't see the spot. Peter: If you have zoomed around, you'll see that the swarm of hills is arranged roughly in a (semi-)circular shape around the underlying small "basin". Taking into acconut that the bigger hills correspond to greater depths of the geological feature, you could infer its dip and therfore the place on the circle where you should look. Lab Lemming: Germany sounds good, but it's not really near the coast. The geological feature below the surface I have talked about in the first comment is of Upper Permian origin and rather thin. The little hills are known for their content of various heavy metals, sometimes leading to specific flora and fauna. 51.633N-11.536E, near Hettstedt, Sangerhausen basin, Germany. I certainly wouldn't find it without your latest hints. The "geological feature not too deep below the surface" is the Late Permian Kupferschiefer, the classical Cu-Zn-Pb-Ba mineralized bituminous marl. My guess is that the "hills" are actually Anthropocene in age, i.e. they are slag heaps around ancient mining pits: the deeper the ore is, the more sterile has been excavated. The depressions atop these heaps must indicate remains of the collapsed pits. Peter: yes, you got the location right and a nice explanation! However, to be pedantic 😉 : it's the Mansfelder Mulde (Mansfeld Basin); Sangershausen Basin is off to the SW.
Mining started in the Middle Ages, around 1200, and proceeded to ever deeper parts of the Copper Shale until the late 1980s. BTW, thanks for exposing me to new language – I didn't know the word “sterile” yet (only the kind of related “overburden” for open-cast mines). So now we're looking forward to your next WoGE! WoGE #142 is up. Enjoy!